Demon Killer Resin Tube & Drip Tip for TFV8 Tank. It comes with resin tube and resin drip tip in random colors and patterns. Get one as spare part for your smok tfv8 atomizer. 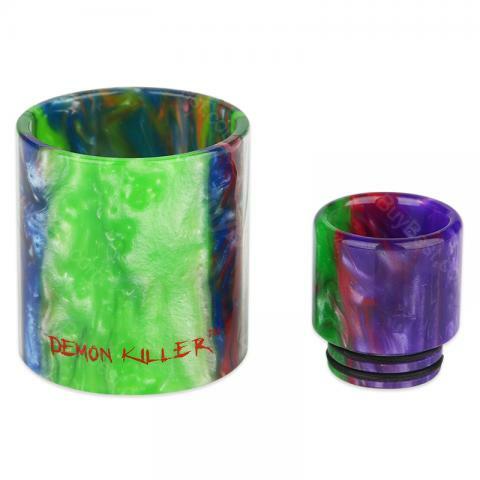 Demon Killer Replacement Resin Kit consists of a drip tip and a tube, which is well-designed with an unique pattern. This resin tube and drip tip is designed for smok tfv8. • It is for TFV8. • Each Resin drip tip has its own unique pattern. We could not guarantee the product has the same pattern and color as that in pictures. We can only ship orders randomly. Hope you can understand. The Demon Killer drip tip perfectly fits my TFV8 Big Baby Carbon tank and adds color to the black design. I received one mostly red with some silver, green, and blue.